WXXI's Indie Lens Pop-Up series presents this film that looks at three rural healthcare providers who try to make a difference in the lives of their patients against overwhelming odds. 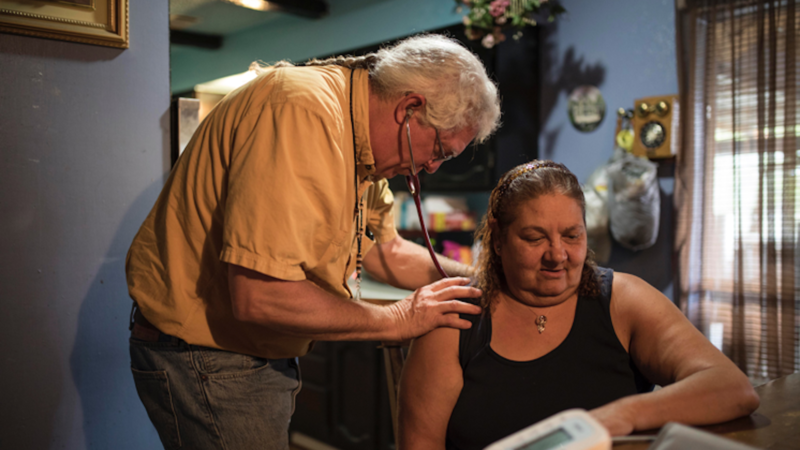 Set against the backdrop of the physician shortage and opioid epidemic in rural America, The Providers follows three “country doctors” in New Mexico at clinics offering care to all, regardless of ability to pay. As their personal struggles at times reflect those of their patients, the providers work to reach rural Americans who would otherwise be left without healthcare. Join WXXI on Monday, March 11, 2019 at 6:30 p.m. at the Little Theatre when its Indie Pop Up series presents The Providers. The screening will be followed by a panel discussion that includes Dr. Mary Tantillo, a Professor of Clinical Nursing at the University of Rochester School of Nursing and a Clinical Professor in the Department of Psychiatry at the University of Rochester School of Medicine and Dentistry; Richard Kreipe, MD, FAAP, FSAM, FAED, founding Director of the Child and Adolescent Eating Disorder Program; and Michael J. Hasselberg, PhD, an Assistant Professor of Psychiatry and Clinical Nursing at the University of Rochester. Dr. Mary Tantillo is a fellow and previous board member of the Academy for Eating Disorders (AED). She served as chairperson for the AED Credentialing Task Force and as co-chairperson for the AED Patient/Carer Committee and was awarded the Meehan-Hartley Award for Public Service and Advocacy by the AED in 2010. She has special clinical and research interests in the areas of prevention, women's mental health, group treatment, and family-based treatment for eating disorders. Over the past 10 years she partnered with patients and families to develop a new and innovative relationally and motivationally-informed multifamlly therapy group approach to treating Anorexia Nervosa in young adults called “Reconnecting for Recovery.” Dr. Tantillo is currently engaged in a research study funded by a grant from the Hilda and Preston Davis Foundation to pilot this intervention and refine its present treatment manual. Richard Kreipe, MD, FAAP, FSAM, FAED is a board-certified pediatrician and adolescent medicine specialist, as well as a Fellow of the Academy for Eating Disorders. His professional focus for the last 30 years has been on pediatric eating disorders, having published numerous research studies, articles, book chapters, position papers and reviews on the topic. Dr. Kreipe is a consultant to the American Psychiatric Association regarding diagnostic criteria for eating disorders in young people, and is a past-President of the Society for Adolescent Health and Medicine. He is the founding Medical Director of the Western New York Comprehensive Care Center for Eating Disorders, which forms a coordinated, integrated network of care across the full range of services and settings required for the treatment of eating disorders. In addition, Dr. Kreipe devotes much time to in-person and web-based continuing education of professionals to encourage earlier recognition and treatment of eating disorders, as well as community-based prevention efforts. Michael J. Hasselberg, PhD, is an Assistant Professor of Psychiatry and Clinical Nursing at the University of Rochester (UR). Dr. Hasselberg is a board-certified psychiatric nurse practitioner, who received his PhD degree in Health Practice Research and is a graduate of The Academy for Healthcare Leadership Advancement through the Healthcare Association of New York State. He founded the UR’s Telepsychiatry program to provide psychiatric care at a distance. He was also integral in obtaining funding to bring the Project ECHO® model to New York State in 2014 and served as a technical expert panel member on the ECHO Act for the Department of Health & Human Services. Dr. Hasselberg has published on telebehavioral health in peer-reviewed journals and has been invited to present on his work at regional, national, and international forums. He was recently selected by the Robert Wood Johnson Foundation to become a Clinical Scholar Fellow, and during this fellowship he will build a “Digital Web” leveraging telehealth, computing analytics, mobile apps, and virtual reality technologies to navigate and overcome the challenges of integrating behavioral health into rural communities.